On Monday I had my first chance to go out on a MedEvac flight. It was a pretty simple case; a young woman in labour in one of the small communities up island. 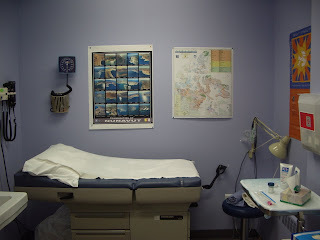 The small communities on Baffin Island do not have facilities for obstetrics, so pregnant women are brought down to Iqaluit at 36 weeks gestation, and delivered at the hospital here. 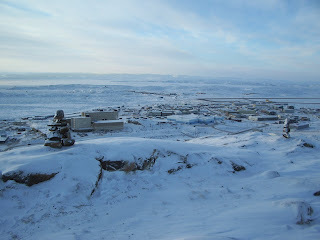 While they are in Iqaluit, the pregnant women are housed in a large apartment structure built mainly for this purpose. One patient I saw memorably referred to it as "the prison for pregnant ladies". This is a controversial system, as it usually means the pregnant women must leave their families behind for 4 or 5 weeks, so it is not suprising that occasionally they go back to their communities to see their families earlier than they are supposed to(i.e. before they have had the baby). 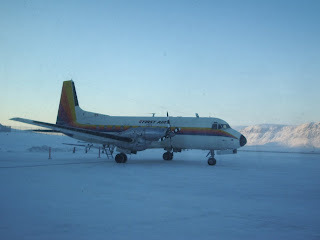 In this case it all went well, the labour was very early and so we transported the patient back to Iqaluit without any incidents, and did not have to deliver a baby in the nursing station or on the plane (which would have been bad). It was great fun to fly along with the air ambulance crew, and was a fun test of my emergency skills. Here is a picture of the inside of the air ambulance. I've also included a picture of the Airbus A-380 which is again up here doing test flights. It is absolutly huge! 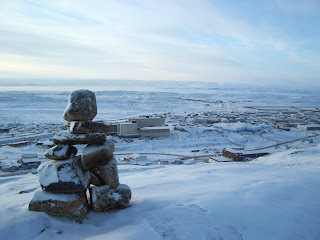 Let me take you on a tour of where I live and work while I am in Iqaluit. I mentioned previously that I was living in the apartment building that is referred to around here as "the 8-storey", being the only building of that sort of height in the town. The apartment itself is quite nice, clean, well furnished and modern. It has been a very comfortable place to stay, and I have no complaints about it at all. It even has cable TV, and since we have avoided cable at home, I will admit to watching some trash-TV while I have been here (although in the picture below you will notice I am watching parlimentary committee discussion........which may be even worse). 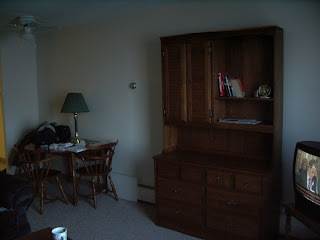 The pictures below are of the apartment. The hospital here is also reasonably up to date. 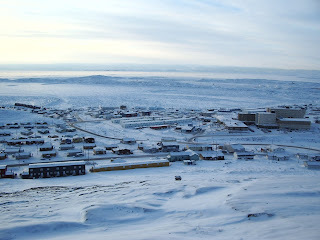 It is a bit crowded for space, since the population of Iqaluit has been growing at a very rapid pace over the last few years, but the addition of the new hospital should solve that issue. 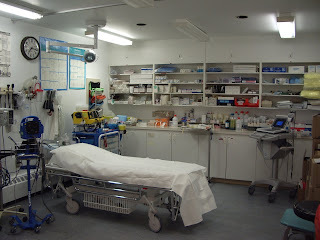 The emergency department has all of the same supplies, and equipment as an emergency department down south. The only odd peice of equipment I have stumbled across here are the defibrilators, which are a bit elderly, but appear to work well. 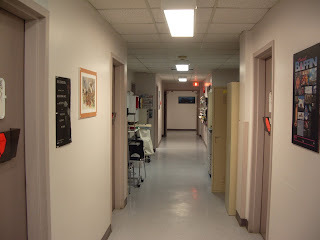 Here are some pictures of the office and emergency department, and the staff lounge. I have seen a lot of very interesting cases since I have been in Iqaluit, and the medicine here seems really interesting and enjoyable. In the weeks I have been here I have seen: lots of sick babies, an intercranial bleed, a young child with WPW, a 1 month old with jaundice, a spinal fracture, cases of TB, and more. It's challenging and fun, especially since the other doctors up here are all easy to approach and ask questions of. It's been an enjoyable experience to say the least, and although I am looking forward to going home later this week (and seeing Julia), I do hope I will be back. Last night some serious weather blew into Iqaluit. The wind howled along at 80 to 100kmph the whole night, and it was a total whiteout! This morning the wind was still blowing, and it was hard to tell if it was snowing, or if the wind was just blowing the snow around. There were drifts everywhere, and no visability so the town was closed down. I made it into the hospital, since it is only about 500m from my apartment, but I did bring my cell phone and GPS just in case, and when I was out there I really couldn't see more than about a foot in front of me. 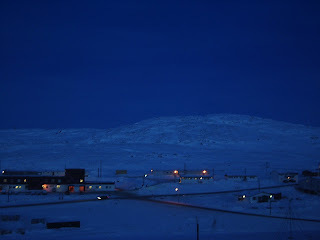 Iqaluit in many ways is still a frontier sort of place, and it sometimes seems like it's on the edge of the world, or at least on the edge of the part people should be living on. 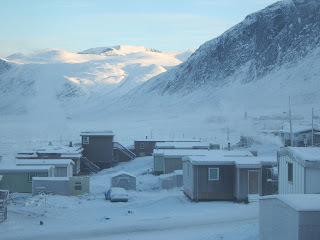 It makes me think of the cold in my favorite Robert Service poem, "The Cremation of Sam McGee"
Yesterday I returned from a visit to Pangnirtung, a small town on the eastern shores of Baffin Island. 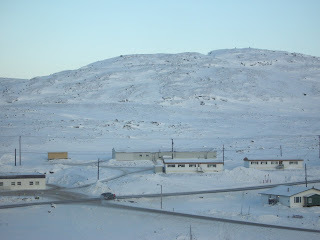 Like many northern settlements, the smaller places in Nunuvat usually have a nursing station, and are only visited occasionally by a doctor. 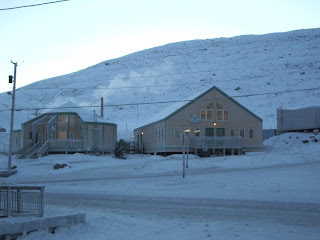 Iqaluit, and Baffin Regional Hospital, provide medical support to many different small communities in the eastern half of Nunavut. The nurses in these communities all work at an extended spectrum of practice, assessing illness and injury, perscribing basic medications and antibiotics, taking X-rays and consulting with the doctors in Iqaluit by phone. In Pangnirtung a doctor drops in for a few days each month to see difficult cases that cannot be easily handled by the nurses. It was going to be a busy trip, so one of the Family Medicine Residents here in Iqaluit came up the coast with me, to help me see all of the patients. We saw a lot of interesting cases while we were there, including a couple of cases of Tuburculosis which is still quite common in the north of Canada. We also met many interesting people while we were there. The history of the Inuit people is very interesting, and it was not until the 1950's when the post World War II arctic became of strategic military importance that the majority of Inuit were forced to abandon a traditional nomadic way of life in favour of permenant settlements. Many of the elders I met in Pangnirtung had grown up living a traditional nomadic lifestyle, and I had the opportunity to talk with a few of them about their traditions over the few days I was there. 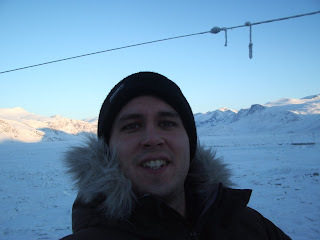 Most of the elders only spoke Inuktitut, and translators helped us to speak with them. Interestingly, many of the younger people also use Inuktitut as a first language, and their traditional language is also widely used in the school system. 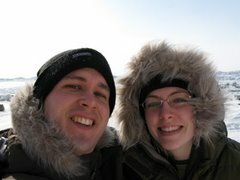 It was fascinating to learn about the Inuit culture in a place where that culture is still very much alive. 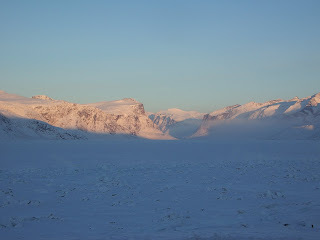 Pangnirtung itself is located in a deep fjord on eastern Baffin island. The landscape here is incredible, with deep water channels and high cliffs side by side. The town is nestled into a small flat area between mountain and water. 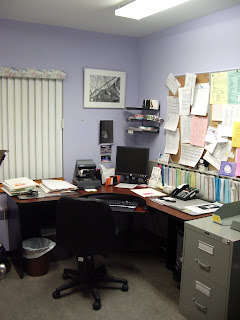 While I was at the Health Centre, they gave me a great office to use. The view made me feel like I was CEO of the north pole. 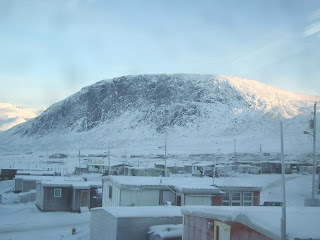 We also spent some time walking about the town, and I took some shots towards the ocean, and the Pangnirtung pass. 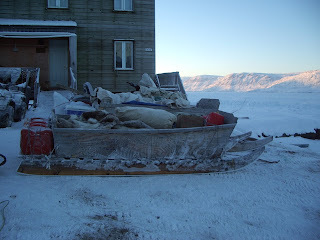 This picture shows a typical sled that a skidoo would pull out on a hunting expedition. Blow up the picture to check out some of the interesting things from the hunt! While in Pangnirtung we also visited the local art studio. On much of Baffin Island, carving is the main art-form, but in Pang there is a lot of tapastery and textile work, and well as print making. A local artist named Jolly, showed us around the art studio, and showed us how the local prints are made with stencils. We met a couple of the artists, and even saw them working on some of their prints, sketches, and etchings. The most famous local artist is Andrew Qappik, who designed the Nunavut flag and coat of arms. While I was in town his wife came by the health centre, and I bought one of his prints. A similar version can be seen here as well as lots of his other work. Art is really one of the main industries in Pangnirtung, and it was great to get to meet some of the artists and see how they work. Here is a picture of the artists studio and print shop. Below that is a picture of the large tapastry that hangs in the local airport. 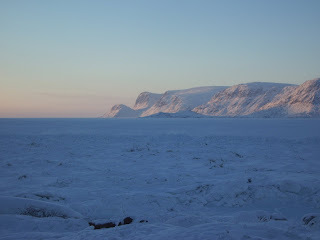 Finally, after 3 days in Pangnirtung, it was time to go home. 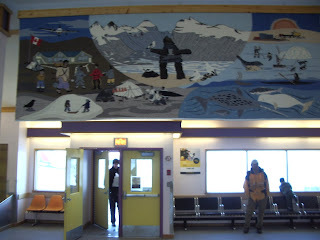 Below are pictures of the Pangnirtung airport, our plane, and our arrival back in Iqaluit. 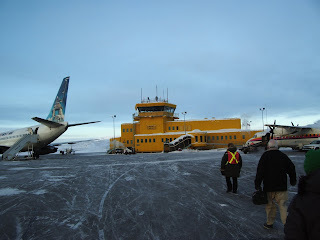 The airport in Iqaluit is really bright yellow. It's an interesting airport, because it has a very long runway, and due to the extreme cold here is a good place to do aircraft testing. Since I have been here they have tested an Airbus A380 as well as some sort of military helicoptor! 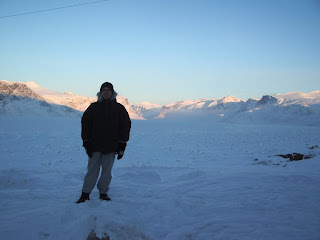 The trip to Pangnirtung was definetely a highlight of my experience in the north so far. It was great to be alble to see how Inuit culture is still alive, and speak to people about their firsthand experiences of living on the land, before there were permenant settlements here. So far all of the people I have met, in the hospital and in the community have been very welcoming, and interesting to talk to. I leave for home in Vancouver in less than 2 weeks, but based on my experiences so far, I think I would like to come back. Do people climb mountains for the thrill or just for the great pictures? I have been working a lot of emergency room shifts since my last post. It has been fun and very interesting, but also fairly tiring. I have always found it difficult to switch back and forth between day, evening and night shifts and that is how most ERs work. I am feeling fairly comfortable in the emerg. and there is good back up here, just a phone call away...either from one of the local MDs or from a specialist in Ottawa. Nunavut is a young territory, both in it's own age (it has only officially been seperate from the NWT since 1999), and in the age of it's citizens, half the population is under 21. It seems to have many challenges facing it in setting up it's own infrastructure. With a total population of about 31,000 spread over one fifth of Canada's land mass, setting up infrastructure is a daunting task. The medical system here is still in the developing phase, and seems to still be working out many of it's issues. Like some other parts of northern Canada there are major problems in the territory with many social issues. This article in this weekends Globe and Mail paints a bleak picture of the place, though most people I have spoken with seem to think the situation will improve in the long-term. Much of the medicine here seems familiar to me from my past inner-city practice. Issues of addiction, abuse, mental health, all with a complex social overlay seem common. There are also interesting medical cases, that most doctors working in the south may have only heard of in textbooks. Tonight I am working an overnight shift in the emerg. and so I was off today. It was a beautiful sunny day, all 5 hours of it, and a balmy minus 30 degrees C. Instead of spending the day resting (like a sane person would have done) in preperation for my shift, I set out to climb the huge hill behind the hospital to get a better view of the landscape. Here are a couple of pictures of the hill, one in full daylight, and a second taken at twilight. That hill, it turns out, is quite steep. It was a bit of a mountain goat's trek to the top and I was pretty hot in my parka, in spite of the -30 weather by the time I made it! The view was really worth it, and I got a good appreciation of the whole town. One thing I did learn, was that LCD screens and batteries are both fussy about the cold. Both my camera, and my GPS were acting up by the time I reached the "summit". I did manage to get a few pictures though. 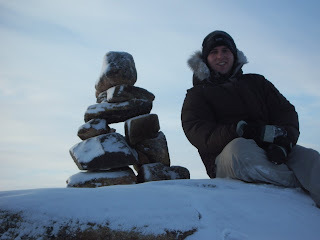 There were 2 nice inuksuk at the top of the hill. In that past when the people here were nomadic, these were sign-posts that helped them find their way across the land. Different inushuk have different meanings. I think the hole in the centre of the one below points the way to travel. Here are some pictures from the top of a hill near the top of the world. Finally I took a couple of pictures of myself at the top of the hill...just to prove I have been there. All in all the climb was worth it. I went to a cool, and weird place, where not many people go, for a view not many people get to see. I guess there was more thrill than just taking the pictures. Tonight is my first overnight shift in the Emergency Dept. It's a bit nerve wracking to go back to doing emergency work after being away from it for a while. I have always had fun working emerg. though so hopefully it will all come back quickly! I think I've finally managed to get my camera to talk to the computer here, and I'll try doing this as a pictorial post. The trip started on Air Canada in Vancouver. The Vancouver Airport has probably the best collection of First Nations art in the city besides the Museum of Anthropology! Here is a very large peice I am very fond of by Roy Henry Vickers. The next leg of the journey was with First Air. As I mentioned in my last post, they are a great company! As we flew towards Iqaluit I got a great view of the sea ice. 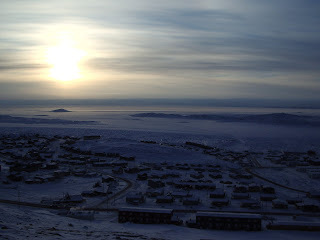 I asked some people in Iqaluit, and they told me that it should usually be frozen quite solidly by this time of year. They also told me that this part of Baffin Island used to be permafrost, but has since thawed. Since the majority of the land is rock, it has not had much effect, but it is still a major change. Even though it is cold here, it is warmer than it should be. I also took this picture of a part of Iqaluit as we flew into the city. I think it does a nice job of capturing how isolated this place is. Here is a picture of the lovely hotel I stayed in. This is the hospital, the old section is on the right, and the new building is on the left. The new section is set to open this spring, and will more than double the size of the hospital. Here is a shot of the apartment building I am staying in. It's a pretty impressive building for this geography! Finally, here are a couple of the stores in the city. Northern Ventures is an everything store, with books, art, clothes, groceries and even a Radio Shack! The North Mart is the biggest store in town, and has groceries, clothes, ski-doos and basically anything you could think of. I was suprised how nice the food and produce were, they even have pineapples! The food is quite expensive, most items are 1.5-2 times the cost they would be in Vancouver. I hope you enjoyed this quick photo post. I'll update with more stories and pictures soon. Travel is always tiring, but the most tiring kind of travel is the kind that occurs with Air Canada. I will refrain from ranting about the details of Air Canada's poor customer service, late flights, and mishandling of baggage. Anyone who has flown with Air Canada will recognize this as a recurrent story. A flight with Air Canada is always an exercise in frustration. So the Vancouver to Ottawa leg of the journey (with Air Canada) was quite tiring. 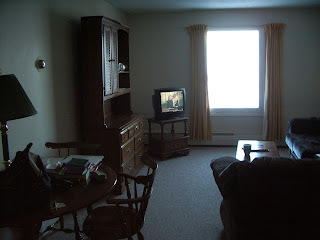 Once into Ottawa I checked into a hotel called Southway Inn. 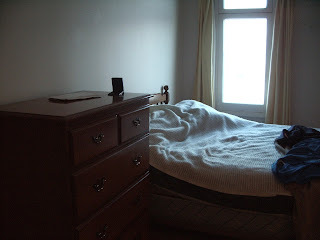 It was very nice, and had a very comfortable bed which was the main feature I was after. The next morning I went back to the Ottawa Airport for the next leg of the trip from Ottawa to Iqaluit. This flight was booked with a company called First Air. First Air is an airline that knows how to treat it's customers! First of all the First Air staff was very friendly, and there is leg room on their planes. On the plane they served a very nice breakfast of scrambelled eggs and a crepe (CREPES on a PLANE!! GENIUS). After the meal they brought around heated facecloths, which was an excellent touch. As if that wasn't enough, near the end of the flight they brought around hot cookies for everyone! If I wasn't already totally jaded about Air Canada I am now. First Air has them beaten by miles. The flight into Iqaluit was very cool. We flew over some sea ice that was quite broken up with fracture lines, and got a good view of the rocky landscape of Baffin Island. This is far above the tree line so rock is the dominant landscape feature. The hospital sent a nice fellow named Keith to meet me at the airport and he gave me a tour around the city before bringing me to the hotel. I was actually quite suprised how many stores and businesses there are in this city. In the past I spent some time in Moose Factory in northern Ontario, and based on that experience I was expecting basically a northern store and not much else, but it looks like they have much more variety here! Today is my first day in the hospital, I have a clinic this afternoon which should be interesting. Next week I am flying into a different community on Baffin Island, called Pangnirtung to do some clinics. It will be very cool to go and see this community that I would never otherwise get a chance to see. So far it's been an interesting experience, and I am looking forward to what's to come! Having spent a lot of my time in the past year and a half working with patients who are homeless or marginally housed, I thought I would post some thoughts on homelessness here in the blog. Homelessness is a complex problem and I don't believe I have any magical answers to the issue. I do believe that dialog is a starting point for complex issues however, and hope that posting about the issue raises the level of the dialog that is going on. In any dialog it is important to define terms of reference up front. In 1996 at the second HABITAT conference in Istanbul the UN member states present agreed on a definition of housing: "Adequate shelter means more than a roof over one's head. It also means adequate privacy; adequate space; physical accessibility; adequate security; security of tenure; structural stability and durability; adequate lighting, heating and ventilation; adequate basic infrastructure, such as water-supply, sanitation and waste-management facilities; suitable environmental quality and health-related factors; ..." This definition highlights the fact that a home is not only a structure, but also offers saftey, privacy, and basic (culturally appropriate) utilities, and that these features are durable over time. Another important concept in the discussion is the concept of near-homelessness. Near-homelessness defines those people who are in danger of becoming homeless, typically those who would be homeless if they missed one paycheck. An example of near-homelessness would be a family who would be unable to pay for shelter if one parent missed a single paycheck (for example due to illness). In fact, a discussion of homelessness is not only a discussion of those who are unhoused, but also of those who are inadequately, and marginally housed. One long-term patient of mine who had been homeless and living outdoors for over a year framed the problem as a classic Morton's Fork type of choice (a choice between two equally unpleasant alternatives): "The real choice," he told me, "is to live outside in the rain, or to live inside with the bedbugs." His observations of the reality of low income housing in Vancouver highlight how homelessness and inadequate housing are intertwined. In British Columbia a single adult person on social assistance recieves $325 per month for housing costs. 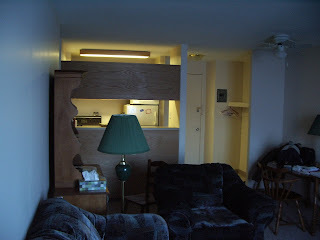 The type of housing this typically provides is in a single room occupancy hotel (or SRO). An SRO is typically a multi-floored hotel type of housing. 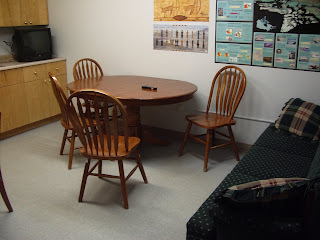 Each unit typically consists of one room, off of the main hall with a locking door. 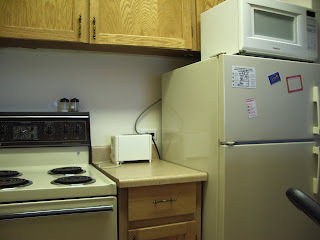 Individual rooms may have a sink, and a hotplate for cooking, and rarely have a private toilet or shower. Usually the toilet and shower are located at the end of the hall, and shared by the tenants of each floor. Although there are well maintained SROs in Vancouver, this is not the norm. Many SROs have problems with ongoing infestations with insects (especially bedbugs) and rodents. Many are inadequately maintained, and have frequent issues with heating, electricity, and problems with water pipes. Many have poor security. Many rooms have inadequate locks, and many buildings have little front door or front desk security. It is not unusual for drug-dealers to 'take over' a room on a floor of an SRO in order to ensure monopoly on illicit drug sales on that floor. Typically the room taken over is of someone who is percieved as an easy target, elderly, or ill. Clearly many SRO type residences would fail to meet the UN definition for housing. Many of the persons who live in SROs are living there marginally, paying for their stay with social assistance that is at risk of being cut off, and at risk of eviction due to condemnation, remodelling, or closure of the hotel itself. For those who are homeless, housing really can be a choice between the devil and the deep blue sea; to live outside in Vancouver's rain, or to live inside in inadequate conditions, with the looming threat of return to the streets. The issue is not as simple as closing SROs. In fact SROs, as inadequate as they often are, provide the majority of basic affordable housing in downtown Vancouver. The affordable housing that exists is not nearly adequate for demand and it can be very difficult to find vacancy in an SRO in Vancouver, especially in winter. The homelessness issue in Vancouver is growing. In my own experience working in a Community Health Clinic on the Downtown Eastside it was normal to see new homeless patients come in to the clinic most days. Some of these patients were new to Vancouver from other parts of BC or Canada, and some were long-time Vancouver residents who had lost their housing. The 2005 Vancouver Homeless Count provides an estimate of the number of homeless people in Vancouver. Although there are flaws with the design of the count, and although it probably underestimates homelessness, it does show that the number of homeless is on the rise. In 2002 the count enumerated 1121 homeless persons, in 2005 the count was 2174. The count also highlights the diversity of the homeless population: women, men, youth, seniors, first nations, and families. Only 45% had any steady income or were on social assistance. Seventy-four percent reported a chronic medical condition, and almost 50% had addiction problems. The data from the Vancouver Homeless Count fits well with what I have observed over the past year and a half working in the Downtown Eastside. Homelessness is growing, and there are new homeless people on Vancouver's streets every day. The homeless population diverse, and includes many groups not traditionally considered in the discussion of homelessness. There is a lack of good, and affordable housing in Vancouver, and the near-homeless and marginally housed vastly outnumber the homeless, though they experience many of the same problems. Homelessness causes medical problems, and makes existing medical problems worse. In my experience living outdoors makes problems with addiction, mental illness and serious diseases like HIV/AIDS much worse. The issue of homelessness in Vancouver is complex, and growing. As costs of living in Vancouver, housing prices, and rental rates continue to climb we continue to see widening of the disparity between rich and poor. In my opinion we should be looking at root causes of homelessness, determining risk factors for future homelessness and addressing these early. We should be looking at ways to help people currently struggling with homelessness, near-homelessness and inadequate housing, by developing stratagies that address transition away from homelessness through addressing the disparities that result in homelessness in the first place. Addressing addiction, mental illness, physical illness (especially HIV/AIDS), addressing the causes of baseline poverty, and providing support to specific groups of homeless persons such as women fleeing violence, first nations persons, refugees and imigrants to Canada, and persons discharged from the prison system all play a part in addressing the issue of homelessness. Vancouver is facing a difficult crisis, and based on the data available the problem seems to be getting worse. We need to have an open and honest dialog about this issue, and to look at new and creative solutions if we are going to move forward and towards real solutions. If this issue interests you, check out homelessnation.org a site where real people struggling with homelessness give their perspective on the issues. 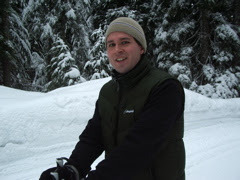 Is there really snow in Vancouver? Living in Vancouver it is often hard to believe that we do, from time to time, get "real" snow here. Being from Ontario my old idea of real snow has more to do with snowbanks and blizzards than we usually have in Vancouver, but after a year and I half in Van, I guess I am getting soft. 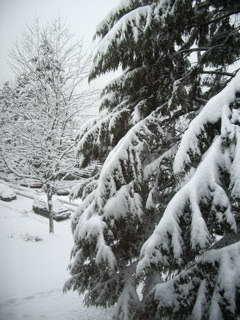 In early December we did have, what seemed to me, like an honest to goodness snowstorm, and woke up to the usual green of Vancouver covered in fluffy white snow. Julia snapped this picture of it, to prove to our friends in the colder parts of Canada, that we still get some "real" weather here from time to time! I do have to say that even after living here for a while, I get a kick out of seeing people use umbrellas when it snows, I guess that is a Vancouver thing? For Christmas Julia and I mostly got each ther presents to prepare for our coming move northwards. One of the cool things we decided to get was cross-sountry ski equipment. We went to MEC and spent lots of time figuring out what would work best, and yesterday we went to try out our new gear for the first time. 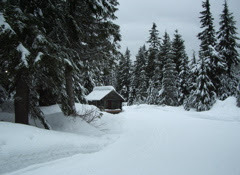 In spite of the green-ness of Vancouver, there is really a lot of snow here, and to find it all you have to to is go up. So we drove up up up to Cypress to do some skiing. The weather was great and so was the snow. As you can see in the pictures we were all ready for a good long ski. 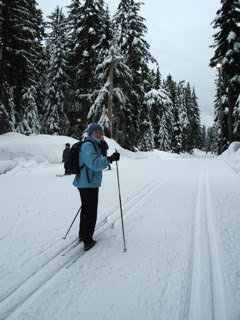 Unfortunately one of my skis was apparently defective and the binding snapped in half about 20 minutes into the trail! 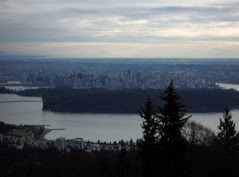 So we drove down down down, and snapped a great picture of the city on the way, and spent the rest of the day trying to get a new set of skis from MEC. 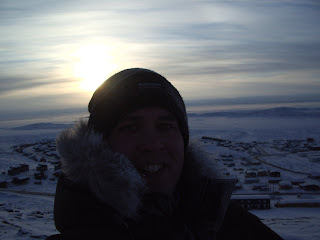 So the skis are now on order, and we will try for a second outing when I get back from my locum in Iqaluit. 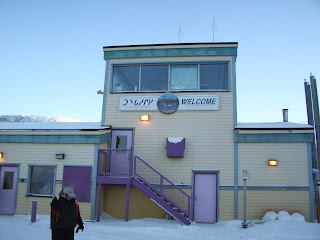 For those of you who think skiing in the far north is a crazy idea, check out: www.inuvikskiclub.ca A ski club at the top of the world who knew! !